Every year in Queensland around 70 kids under the age of 15 end up in hospital after suffering an electrical injury and more than 20 of them are under 5. With approximately 40% of Queensland households having kids, we thought it was worthwhile sharing our top 5 household electrical safety tips to help keep you and your kids safe at home. Believe it or not all electric shocks are preventable with just a few simple measures. As we highlighted in our last blog post, installing RCDs (Residual Current Device) also called safety switches on all circuits in your home will help prevent electrical shocks. One of the biggest issues in most homes now is that we don’t have enough power points to manage all of our appliances. This is especially noticeable in the lounge room with all the technology around the TV. Never ‘daisy-chain’ power boards. Installing new power points is a quick and easy job for an electrician. So if you’re finding that you don’t have enough sockets to manage all of your electrical needs, give us a call. It’s vital that you immediately repair or replace damaged equipment including power points or appliances with frayed wires. These are a major cause of shocks, burns and electrical injury. The quick-fix of wrapping tape around the end of frayed wires just won’t cut it. Get a licensed, qualified electrician to repair dangerous wiring. If you have particularly young children at home, install plastic plug covers on all unused power point sockets. These can help to prevent kids sticking fingers or other objects inside and potentially receiving an electric shock. You can even install power point sockets with built-in shutters that close when a plug is removed. 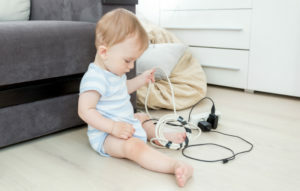 As your kids get older and start using electrical appliances unsupervised, make sure you teach them the correct way to plug and unplug equipment safely, including ensuring that switches are in the ‘off’ position and holding the plastic plug rather than the cord to unplug equipment. Household electrical safety should be a top priority for all parents, especially with the number of electrical appliances used by all family members nowadays. If you need advice on whether your home is electrically safe for you and your children, or you would like to have safety switches installed on all circuits, give one of the team at Unified Electrical a call and we’d be happy to assist.